Settlement in what was to become Wilmer dates to the arrival of Andrew K. Gray, which was sometime prior to 1850. When the railroad (the Houston and Texas Central) made a stop here - the community was going under the name Prairie Valley. Several dates are recorded for the founding of the town - the earliest being 1876. The post office was renamed in 1884 after A. J. Wilmer, a popular conductor on the railroad. The 1890 census showed 100 Wilmerites living here and the town had all the elements to insure a bright future. The population doubled to 200 about the time the U.S. entered World War I. Fire burned most of downtown Wilmer in 1929 and firemen couldn't draw water fast enough to fight the blaze. Rebuilding was to the east - along the highway leading to Dallas. 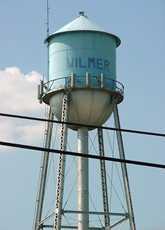 After WWII, Wilmer incorporated and the mayor was elected on the platform of installing a good water system. The year was 1945 and the population was 450. By the late 40s - Wilmer's water system was still unresolved. Insurance companies charged merchants and homeowners some of the highest rates in the country. Wilmer and Hutchins consolidated their schools - with the construction of a new building halfway between the two towns. A full eighty-five percent of Wilmer's workforce commuted to nearby Dallas. The population increased - but at a much slower rate than other Dallas County towns. Anyone wishing to share information, memories or photos of Wilmer, Texas, please contact us.